A team of television program production, media marketing, socio-commercial message development, audio-visual production and audio visual bank, publicity and media coordination, Meeting Point has several identities and projects under its name. It has been operating 15 minute news package Hamro Kathmandu, a daily news program telecast at 6:30 pm and re-broadcasted at 9:30 am next morning, and 30 minute Nepal Mandal, a fortnightly program telecast every Saturday at 5:05 pm and re-broadcasted at 3 pm next day, both on Nepal Television. 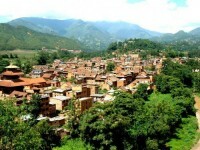 Nepal Mandal is focused on culture, heritage and tourism. Both programs are their attempt to show the plans policies and activities of Kathmandu metropolitan city office. Located at Lazimpat in Kathmandu, is Meeting Point’s own studio for television shooting, news desk, news reporters, camerapersons and visual editors. It also has a marketing team that has their own commercial time for broadcasting TV commercial, social message, public notes, etc. The sub units under Marketing are media commercials, audio visual, training while radio commercials, TV commercials and print and publication are specialization of media subunits some of them being corporate house, financial institutions, schools, colleges and consultancies, NGOs and INGOs, manpower, public organizations and local institution. It also has a media commercial production team that has developed the media commercial, called PSA, public message and promos of different program, newspaper advertising as well as radio jingle. There is also a training division at Meeting Point which conducts television production training on television journalism with the course of reporting, camera works, visual editing, television presentation, graphics and animation, media marketing, commercial production and hardware devising technique. It also has audio visual and documentary production unit along with television program production. This unit handles all sorts of audio visual resources like professional digital video cameras, visual editing sets, studio, lights and sound facilities with tariff defining the service charge.